Pull on the waders and grab the pole because it's time to head to the lake for a chance at a massive catch! Click here to play! Cast your line to see if you can pull in all the big cash wins. Any fisher knows that a trip to the lake is not complete without bringing in a big catch or two. 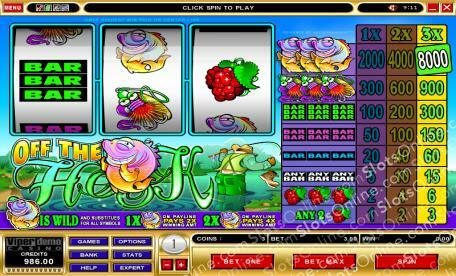 Spin three fish across the single pay line in this game and you'll get up to 8000 coins! You won't be catching much without a lure, so spin three of these colorful hooks across the pay line and you'll bring in up to 900 coins. There are also triple, double, and single BARS to help you reel in the big wins. Spin in some grape bunches for a light snack as these fruit treats will bring in up to 6 coins! Plus, there are a couple of other combinations that will help you bring in some wins. This 3 reel game takes a maximum of three coins, so you'll want to wager all three in order to activate the highest pay table and gather up the biggest wins. It's time to hit the lake and see if you can reel in all of the biggest wins in Off the Hook! The fish acts as a wild symbol and will substitute for all others to help you bring in more wins. If you spin one in a winning line, you will double your prize. If you spin two in a winning line, you will quadruple your prize.